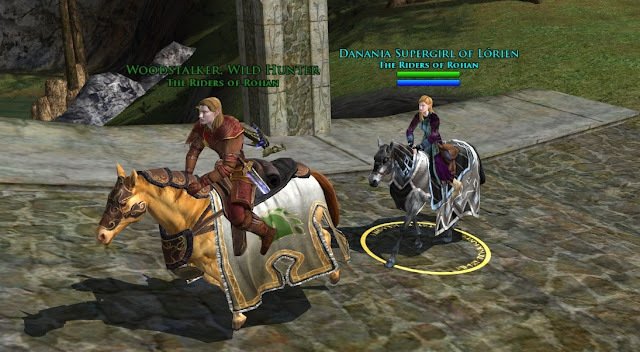 The Moors, Lotro’s PVP (player versus player)… is a different world. I mentioned before that I spend some time there. Am I great in the Moors? I would say that I am probably not. I am probably average. 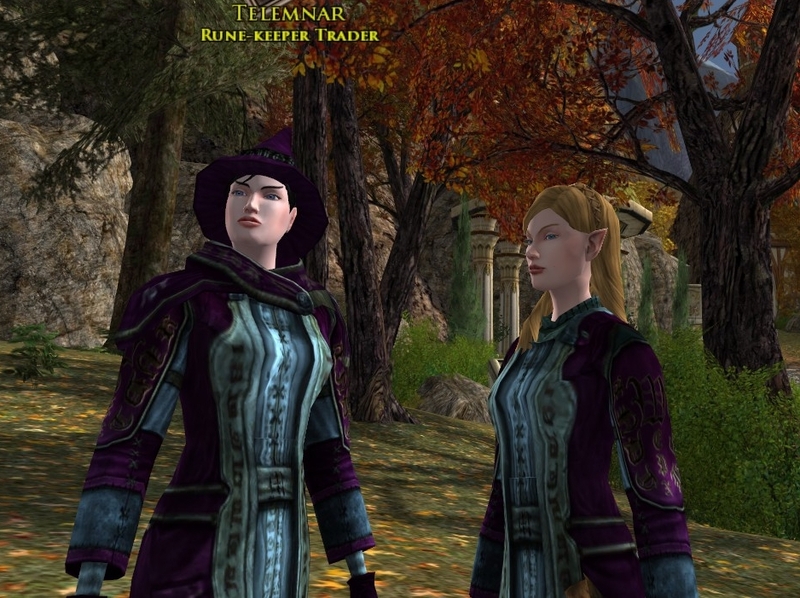 Things I do well… If I have quests or deeds I could be doing, I rarely go to the Moors. So by the time I get there, my gear is often stacked to the nines. Plus, I was born to be a RK, and I know my skills very well. I did not just roll off the truck yesterday. Things I have not done well… I am just starting to learn about the creep classes so I have no insight as to what to expect for creep tactics or skills. Do I heal a team member? Do I hit a creep with lightning? Stun? Fire DoTs (damage over time)? Slows and ices? Woodstalker taught me some recently, but my decision-making could be better. Also, the Moors-only attribute, Audacity, makes a big difference, and I only recently got to Audacity 7 (max audacity); thus, I have been fighting uphill for the past few months. As it usually happens, I got my Audacity gear just in time for the moors to receive a major overhaul and time to leave to go level up to 85 and mounted combat. Audacity: Getting to higher Audacity was a big turning point. It was clear how strongly certain creeps had the ability to dominate a fight, and though I am a stout end-game RK, I had no chance of beating them with only audacity 1. With even audacity, I am much more evenly matched. You can see the difference in this picture, which shows a large gap between damage mitigations of Audacity 1 versus 7. 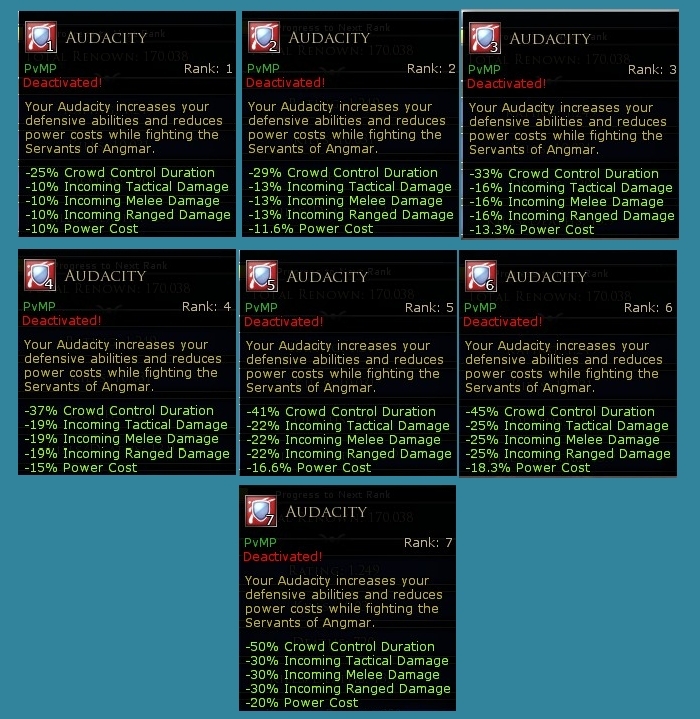 I see some talented creeps often enough, that I can actually feel the difference, having progressed from Audacity 1 to 7 while they were already maxed out. 10,000 creeps: I hesitated to post this shot, but here is my War Tab. 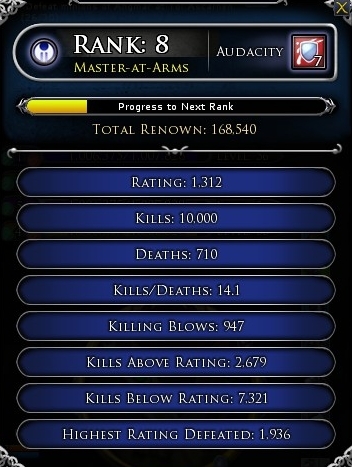 I am rank 8, Master-at-Arms, and this war tab shot was taken at kill number 10,000. I can only imagine that it is on par with other players. My rating ranges from 1100 – 1550, depending on how often I’m being ganged up on (or getting the advantage) in any given outing. My “killing blows” (effectively who gets the final shot) stays just ahead of my “deaths”. For a part-time healer, the killing blows stat did not seem too bad. Thankful: While I am thankful to my friends with whom I play, I am also thankful for the Creeps. Without them, the area would just be another fun Quest area. 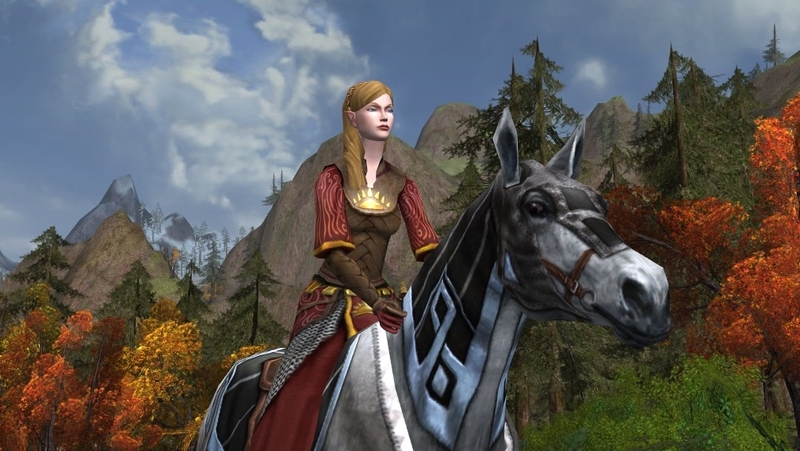 (Yes, I do very much enjoy questing around the Moors!) I would never belittle the Creeps, and am amazed and saddened when either side feels the need to be obnoxious about the other. On a particularly unusual night, after much fighting, my team of two met a team of two Creeps and neither side opened fire. Baglun looks at me as if he has never seen a woman up close before that wasn’t hitting him. I stopped to rest a moment, and Ijust did as well, while Dwasori watches to make sure nothing interesting happens. In the end, Creeps will be Creeps and they opened fire on us when an obnoxious dog could not control himself. Such is life in the Moors, lol. Creep-side: One night, when no creeps were out and the entire map was Blue freep controlled, many of my friends decided to log on creep-side to try to turn the balance and even the field a bit. Thus, I followed and a new warg was born. The first thing I learned is that a fresh warg with basically no skills or talent is really terrible. I never attacked a freep, but it was clear that even if I wanted to, there is no way my “werewarg” self would have had a shot against an experienced freep. That said, I think by the time the creep is higher rank (I am told Rank 5 or so) the creep can be quite formidable. In some cases (like Arachne of Arkenstone)… <in Obi-won voice> they “will become more powerful than you could possibly imagine”. 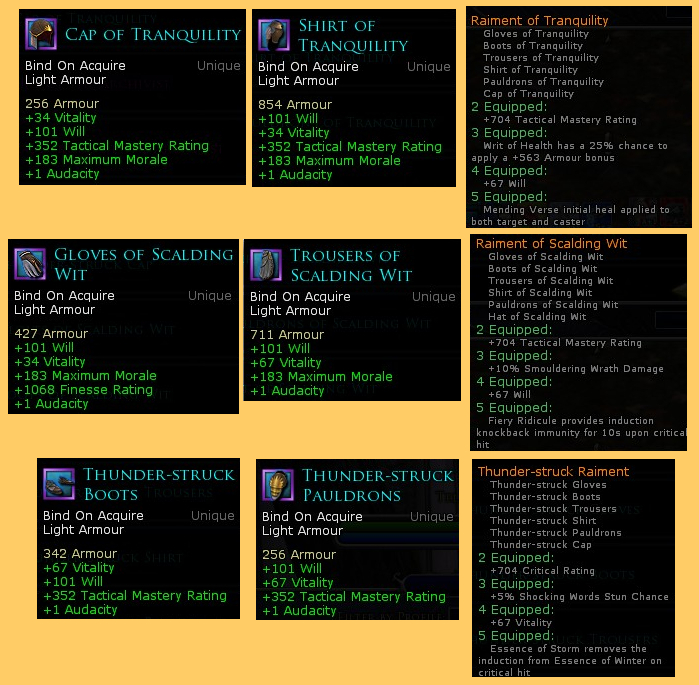 The September-2012 Ettenmoors update should be interesting as it looks like the spiders and a couple others have the potential to become even MORE powerful, on top of probably being the most powerful of the creep classes. Here is a shot of the horde rolling into TR. RK Armor: I was asked about Moors RK armor and which set is best. Telemnar and I are wearing the old Padded Moors set in this picture. However, I don’t think she ever leaves Glan Vraig so she doesn’t need the Audacity of the better armors. Let’s look at some of the statistics of the better ones. Here is a table of Moors armors listing “stuff that matters to a RK”. In this table, Each set shows the stat addition of the combined 6-piece set. The 2/2/2 row is a mix of 2 of each: Tranquility (robe and hat), Scalding Wit (gloves and legs), Thunder-struck (boots and shoulders). These pieces were chosen to maximize the Morale and Tactical Mastery. The 3/3 row is a mix of 3 each Traquility and Scalding Wit, with the same basis as 2/2/2. Dana, which Moors set do I choose? The “special bonuses” associated with sets for getting 3-piece and 5-piece just seem really lame to me. I chose 2/2/2 for its best morale and high tactical mastery and some critical. Essentially, it is difficult to go wrong with any of the choices. The Moors armors are on par with the raid armor as the best in the game. 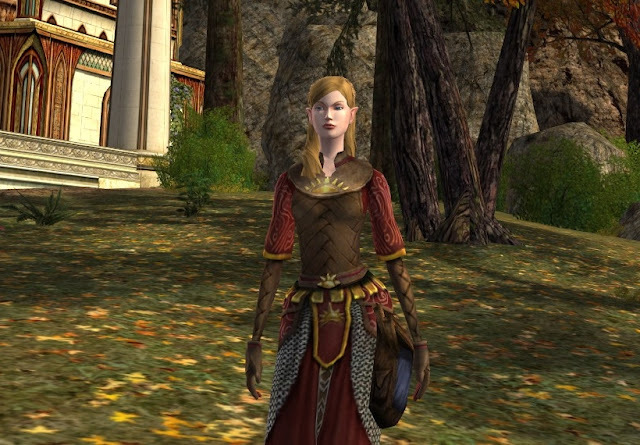 The natural color of the armor is not one I would normally choose, but it is quite lovely. As of Update 6, here are the digits on the 2/2/2 “set”. It will be outdated by next month; HOWEVER, the dev notes say that the pieces can be traded in for a 10% discount toward new armor. I am counting on the 2/2/2 to still be a good choice, and will post a column about it when I see it. Enjoy the small victories! You're completely right about the 'feeling' of audacity. As soon as they rolled that out, my LM felt really squishy and weak in the Ettens. I can't force myself to stay there long enough to grind out commendations, so no audacity for me. I did try questing on my creep, which netted me around 800 commendations in an hour or two.. but I can't keep doing that all the time. Though I know people who have gotten full sets for their freeps through creeping. I don't dislike pvp, though I'm a nub at it probably because I've just not done enough of it. I did more in Rift than I've ever done in Lotro. That's because Rift has warfronts. I don't know about your server, but on mine, it's pretty much all Raid vs. Raid. Sometimes it can be hard to get a spot in the raid and once you're in you don't want to leave and lose your spot. So I end up staying longer than I'd prefer which burns me out quickly I think. I do much better with warfronts because I can jump in and out of them with easy. Also I like scenarios! I find Lotro's "run around attempting to find the enemy" (which sometime can take a little while) to be really boring. And lately the creeps have pretty much taken over my server. Seems freeps are going less and less. I know the Moors is about to change, if you want to read all the changes, I posted the Dev Diary as a page on my blog (at the header, at least for now). On Arkenstone server, group size just depends. I would say that a dominant amount of my Commendations have come from small groups. As a light armor, going Raid versus Raid in the wide open can be a tactically silly decision. A smart Creep raid will go after the light armors, take out the healers and CC LMs, and then topple the rest of Freep raid. Some strategery is involved and it depends on whether there is a Freep leading the group that has tactical sense (some do, some don't). However, as a small group, it is easier to swoop in versus other small groups. And occasionally, though not everyone likes this approach, I prefer questing. Knock out quests in the Lumber Camp and Hoarhallow, swing past Ost Ringdyr to pick up quests, progress into Grothum, do all of those, move west and cleanse the River quest, down through TA if Freep controlled, kill Rockwithers and a tree for 2 more quests. All along the way, as long as a large Creep group isn't targeting us, we will pick up a few creep kills. By the end of the circle of quests and sporadic kills, it is possible to amass a good number of commendations. Also, currently, as I've experienced, a coordinated group of 4-6 Freeps can take out any Keep if less than a couple of Creeps are around. Before the days of Commendations and the Audacity disparity, I had been more inclined to go storming in, trusting on skill to cut through the other side, but Audacity changed the Moors. It will be an interesting and probably uphill battle for the Moors with the Sept-2012 changes. I will probably be on hiatus questing for several months after the change so we shall see how that turns out. Well thank you Mr/Mrs Anonymous! That is my goal... mebbe I'll put that as my header slogan. I love your blog! Just started reading today,and I find it very entertaining. LoL at the Creep who decided to check you out instead of take you out xD the moors sound like lots of fun. It makes me wish I was VIP instead of premium. I have a f2p creep myself,named Kunru, but I never ever use him. The Moors can be fun. It can be rewarding, and it can also be frustrating. It gives people a chance to test their skills and opportunity for them to turn the "stupid dial" even higher sometimes. lol My best advice is to remember to relax and enjoy it for what it is (advice I have to remind myself of some times).